See Results Page for more details. 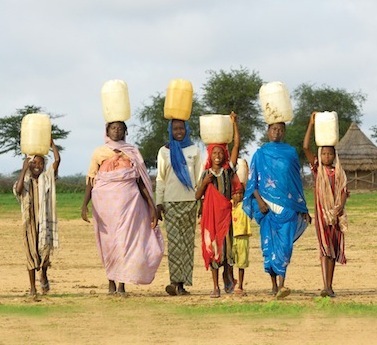 795 million people worldwide do not have enough food to lead a healthy, active life. 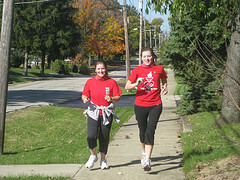 1 out of 6 children - roughly 100 million - in developing countries is underweight..
Join the South DuPage CROP Hunger Walk! The South DuPage community have raised over $700,000 over the past 30 years through holding this annual CROP Hunger Walk, which helps to support the grassroots, hunger-fighting development efforts of Church World Service (CWS) partner agencies in more than 80 countries. CROP Hunger Walks help to provide tools of hope that empower people to meet their own needs. From seeds and tools, to wells and water systems, to nutrition-enhancing Moringa trees, to technical training and micro-enterprise loans, the key is people working together to identify their own development priorities--something CWS has learned through 58 years of working in partnership around the world. When CROP began in 1947 it was an acronym for the Christian Rural Overseas Program to help Midwest farm families share their grain with hungry neighbors in post- World War II Europe. The first CROP Hunger Walk was held in Bismarck, North Dakota in 1969. 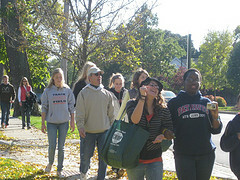 Each year, some 2,000 communities across the U.S. sponsor CROP Hunger Walks. Nationally, upwards of 200 corporations match employee gifts and/or volunteer hours to the CROP Hunger Walk. 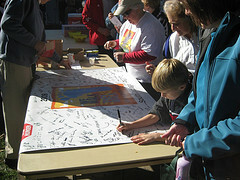 Locally, thousands of businesses and media outlets support their community's CROP Hunger Walk. More than 5 million CROP Hunger Walkers in past 20 years. 68% are over 18, average age is 33.5. 73% of participants say fighting hunger locally and globally is their key reason for taking part. 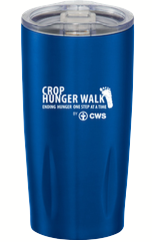 53% say the CROP Hunger Walk is the only sponsored activity in which they participate. In the last 20 years, $294 million has been gathered by CROP Hunger Walkers. Almost $4 million is shared annually to support local hunger-fighting efforts across the U.S. Since 1986, over $800,000 has been raised by the South DuPage CROP Hunger Walk. Since 1986, nearly $200,000 has been raised for local hunger agencies in DuPage County. In 2017, over $30,000 was raised by the South DuPage CROP Hunger Walk. 75% of the money supports the hunger programs of the Church World Service (the outreach arm of the National Council of Churches). 25% of the money supports local hunger agencies, including Hope's Front Door, Northern Illinois Food Bank, People's Resource Center (Westmont Pantry), Downers Grove FISH, West Suburban Community Pantry, and Lisle Township Food Pantry. 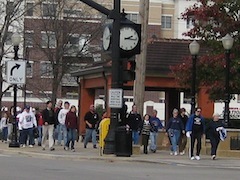 Schools, churches and civic organizations recruit walkers who solicit donations. Local businesses become sponsors by contributing funds. You may join the CROP Hunger Walk either as an individual, or as a member of one of the many participating local churches and organizations. You can see last year's list of organizations on the South DuPage results page. Otherwise, obtain a donation envelope from your church or organization's local coordinator. You can now receive credit card donations online, in addition to collecting donations by hand. Visit the South DuPage Online Sign-Up Page. 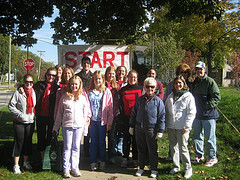 Click to join a team set up by one of the participating churches or organizations or register as an individual walker. E-mail friends and relatives to ask them to sponsor you. Walkers who register online and raise more than $150 by Oct. 28 (two weeks after the walk) will be contacted by CWS to select from a number of possible rewards. Note that you can add cash and check donations to your online total from your HQ when you login to your donation page. If you know someone participating in the CROP Hunger Walk, please sponsor them to help eliminate hunger in the world. Visit the South DuPage Online Donations Page or click on one of the team links on the left sidebar of this page. You can search for a walker by their name or sponsor a team. Thank you for helping to make a difference in the world!